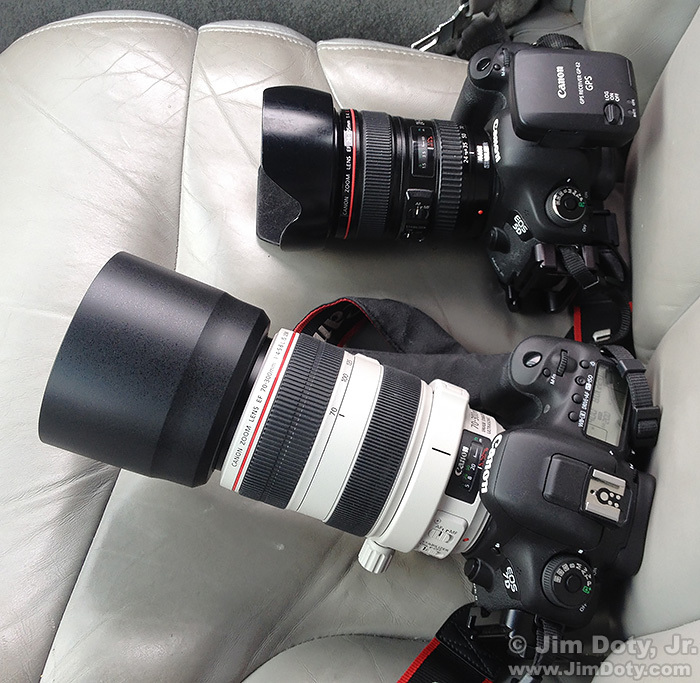 Canon 5D Mark III with auxiliary GPS unit (top) and Canon 7D Mark II (bottom). The Canon 5D Mark III does not have a built in GPS unit so I use the Canon GP E2 auxiliary GPS unit designed to sit in the hot shoe. The Canon 7D Mark II has a built in GPS unit which you can turn on or off in the camera’s menu system. It is a good idea to turn the internal GPS off when you aren’t shooting or it will quickly drain the camera’s battery. I’ve had the internal GPS drain the 7D Mark II battery down to nothing overnight when I forgot to turn it off. My iPhone, like most current smart phones, has a built in GPS that you can turn on and off in the menu. Marker pin, S. Hantz Rd and 19 Mile Road. I needed a location I could easily find on a satellite map. I picked the intersection of 19 Mile Road and S. Hantz Road which has a dark marker pin in the middle of the intersection. The intersection would be easy to spot in Google Earth so I decided to stand on the pin and take photos with a Canon 5D Mark III, Canon 7D Mark II, and my iPhone. 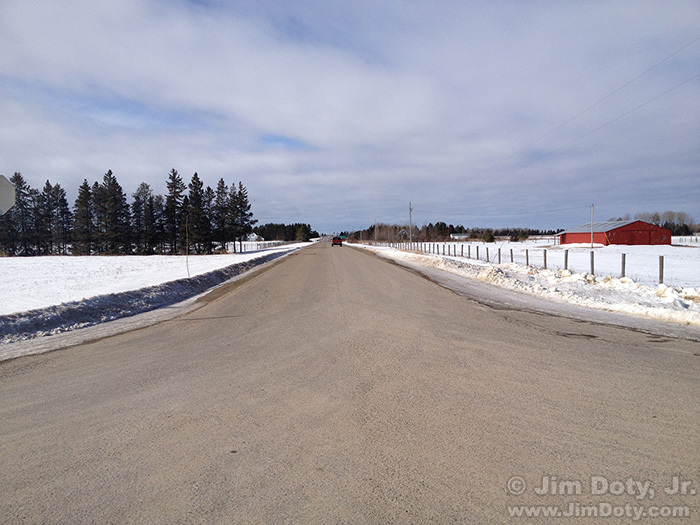 Looking west from the intersection of S. Hantz Road and 19 Mile Road. iPhone photo. My plan was to open all three images in Adobe Bridge, grab the GPS coordinates and drop them into Google Earth and compare the results (this article shows how to convert the numbers so you can do that). I have learned from past experiments (here and here) that the GPS results will usually be off. I had not tested three GPS enabled cameras at the same location before so I was eager to compare the results. Google Earth and Adobe Bridge. GPS coordinates from a Canon 5D Mark III. Click for a larger view. 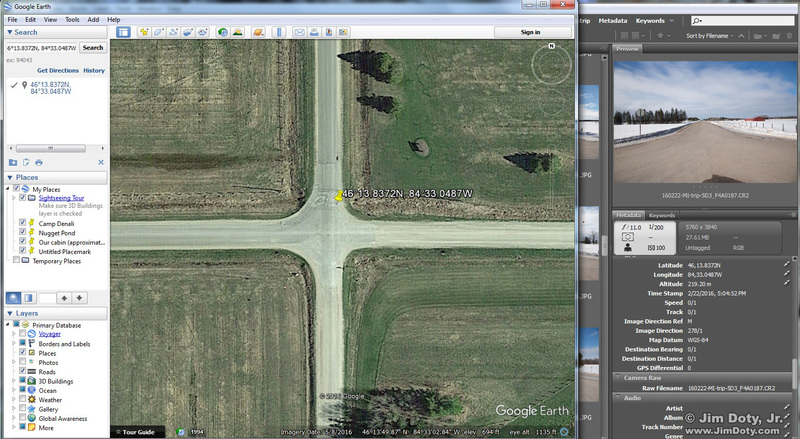 Here are the Google Earth results with GPS coordinates from the Canon 5D Mark III. 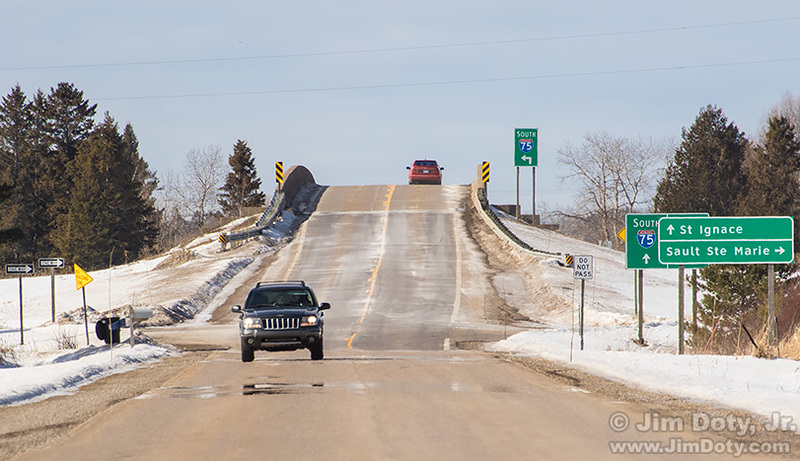 You can see the photo in Adobe Bridge on the right. The red barn has a metal roof that is visible in the Google Earth satellite image. 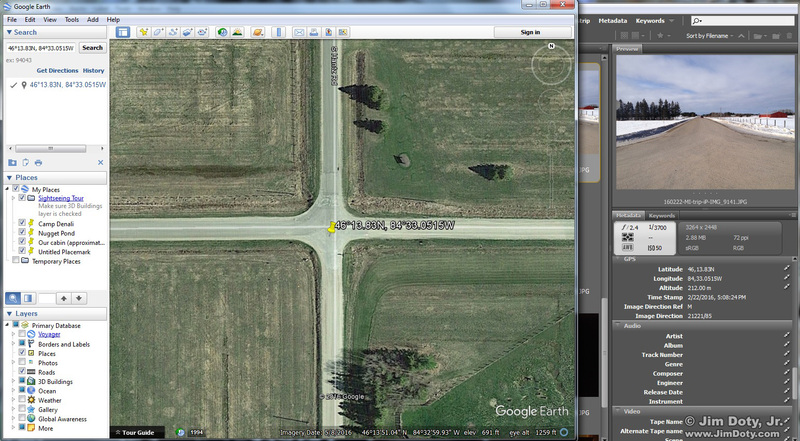 This is a closer look with Google Earth zoomed in to get a better look at the intersection. I was surprised that I could make out the dark marker pin in the middle of the intersection. That just shows how good satellite images are getting. As you can see, the location of the GPS coordinates (the yellow push pin) is about 30 feet north and a little east of the dark pin where I was standing when I took the photo. Satellite images in Google Earth aren’t live of course. I was there in winter and the satellite image was taken in May. Google Earth and Adobe Bridge. 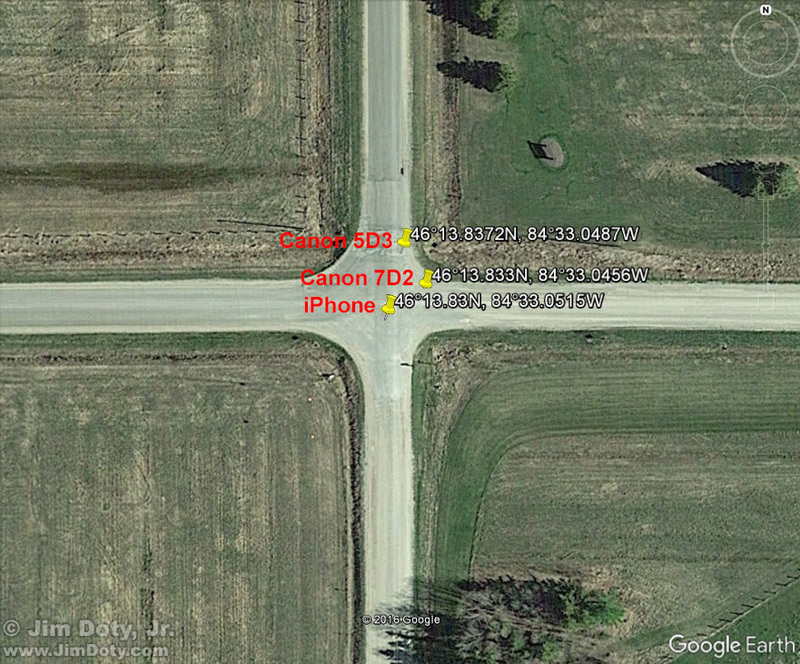 GPS coordinates from a Canon 7D Mark II. Click for a larger view. 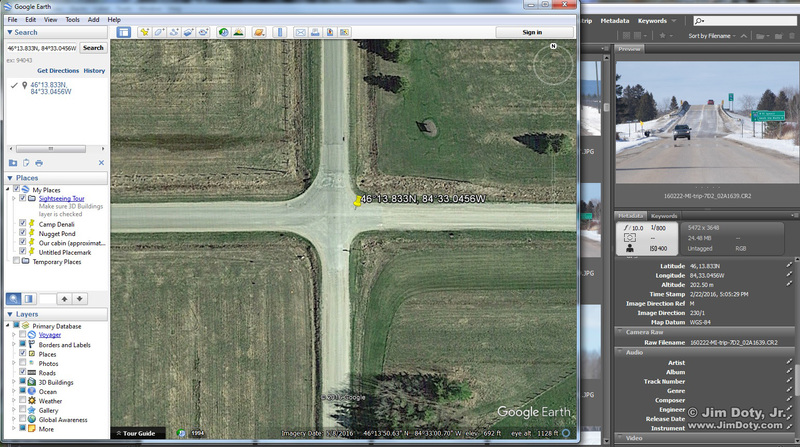 These are the Google Earth results with coordinates from the Canon 7D Mark II. This photo was taken with a 100-400mm zoom lens. 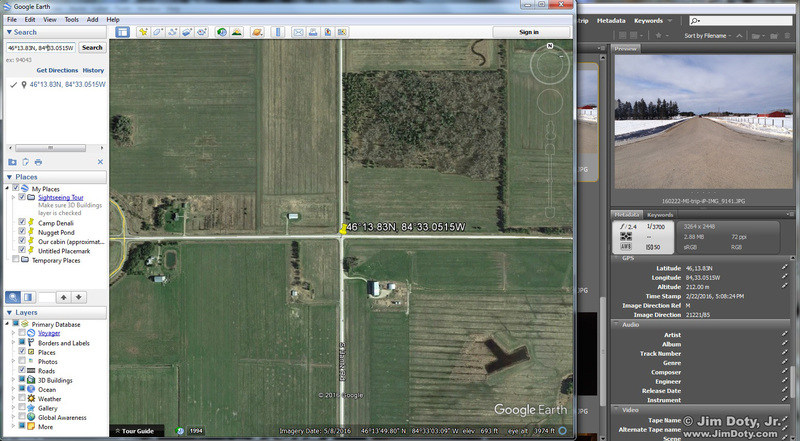 In the Adobe Bridge image on the right you can see the I-75 intersection to the west of my shooting location. A cropped version of this image is at the top of this article. The on and off ramps to I-75 are visible on the left side of the satellite image. Here’ a closer look at the intersection. The yellow push pin marker is about 15-20 feet northeast of the dark marker pin where I was standing. Google Earth and Adobe Bridge. 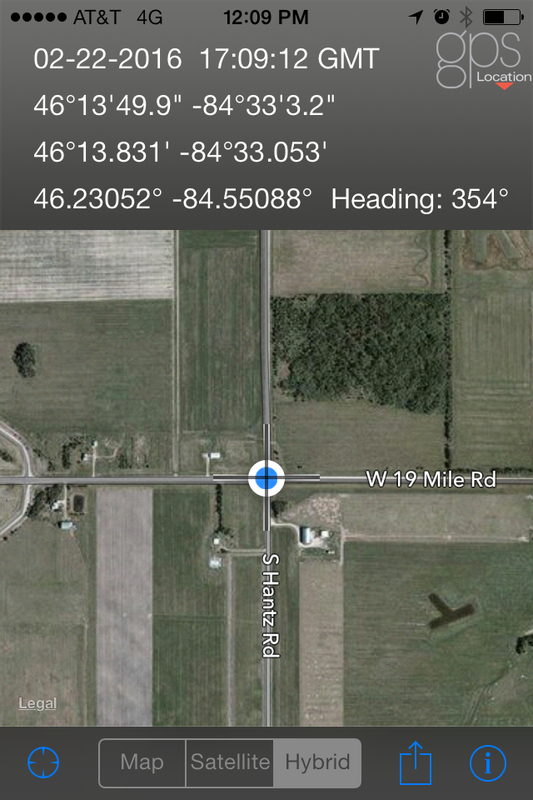 GPS coordinates from an iPhone. Click for a larger view. And lastly, here are the Google Earth results from the iPhone. And here is a closer look at the intersection. The yellow push pin marking the location of the GPS coordinates is less than 10 feet southwest of the dark pin where I was standing. The yellow push pin obscures the dark marker pin in the middle of the intersection. 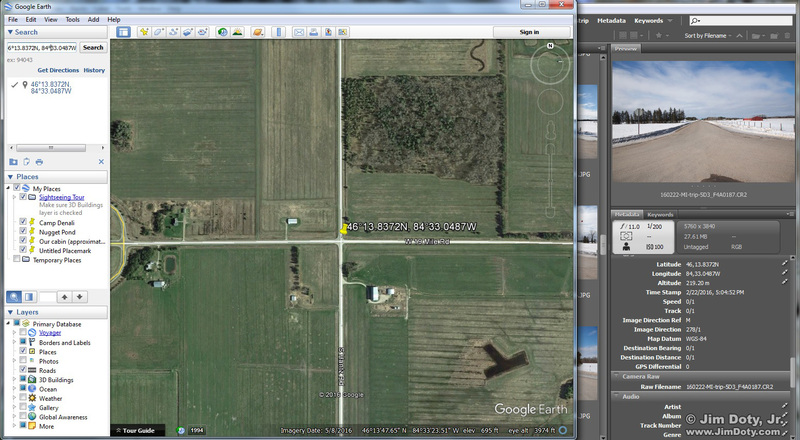 GPS coordinates from all three cameras. Click for a larger version. 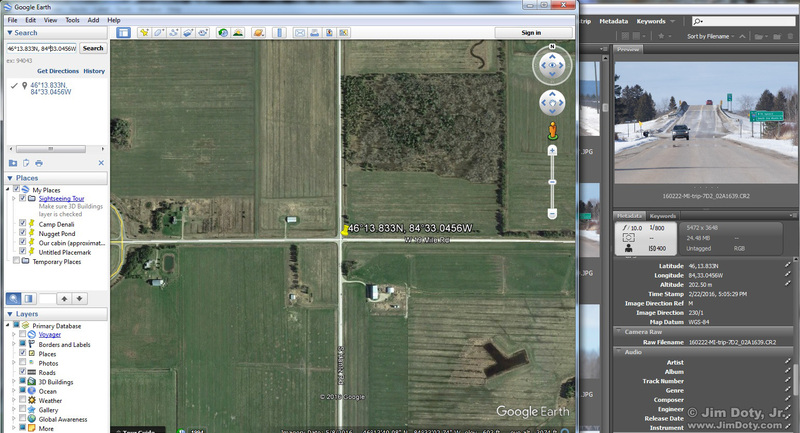 I put all three Google Earth maps together in Photoshop so you can compare the GPS coordinates from all three cameras. They are all a little off and they are all within the accuracy expectations for GPS satellites as provided by the U.S. Government. It is hard to say how much of the variations between the results are due to the GPS units in the cameras and the satellite signals. Satellite signals vary over time due to atmospheric and other conditions. From top to bottom the photos were taken at 5:04:52 pm GMT, 5:05:29 pm GMT, and 5:08:24 pm GMT. Local time (EST) was five hours earlier. I will do this test again sometime. GPS coordinates from the same location using the app GPS Location. 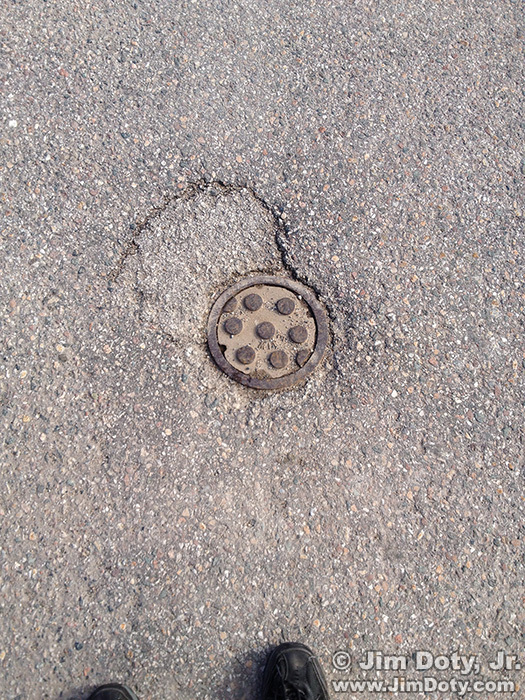 Curious, I turned on the iPhone’s GPS Location app while standing on the metal pin in the middle of the intersection. It gave me slightly different GPS coordinates than the photo taken with the same iPhone less than one minute earlier and using the same GPS unit. The time was 5:09:12 pm GMT (12:09 pm local time). Canon GPS Receiver GP-E2 for use with the Canon 5D Mark III, Canon EOS-1D X or Canon 7D. There is more GP-E2 compatibility information at the Canon web site. The Canon 7D Mark II has a built in GPS receiver which is one reason I upgraded from the 7D to the 7D Mark II.